A lion industry at work in South Africa, depleting its wild lion population, reaching into neighbouring countries to swell its profits. Lion cub petting and extinction of wild lions. Well-intentioned tourists are being duped! – There are around 20 000 lions left in Africa. – South Africa exported 547 of these – bearing in mind that these are only the legally documented exports- probably many more go under the radar. – The captive killing of tamed lions (“canned hunting”) is a growing, un-policed industry. – Less than 3% of trophy income reaches the local communities. – Trophy hunting accounts for only 0.27% of GDP and 1.8% of tourism revenue. – Lions have lost over 50% of their historic range in the last 30 years. – Nature Conservation will not allow tamed lions to return to the wild, as “human-habituated lions” have lost their fear of humans. – The genetics of lions in captive-breeding programs have been compromised, meaning they cannot return to their natural eco-system. 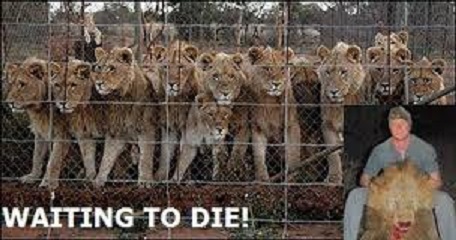 – Over 160 “Canned Lion” killing camps in South Africa established over the past 15 years. – Lion bones are being traded large-scale from captive breeding operations into the Eastern Markets. – Extinction risk for lions is even greater than rhino.